You don’t have to wander too far from Shanghai to find interesting small towns, that is, ones that have not converted into tourist villages of Disneyland proportions. An hour-long bus ride from Longyang metro stop (龙阳地铁站) on Line 2, deep into Pudong (浦东), we found ourselves in the town of Dayuan (大团镇) in Nanhui (南汇). Towns in China have developed with a banal similarity common in suburbia America. The same fading welcome signboards, the same layout of buildings, shops and houses populate next to the highway – all of it, engulfed in swirling road dust. There is nothing particularly outstanding about Dayuan town but there was plenty to explore once you push into the interior. The dynamic of urban and suburban sprawl applies aptly when you compare metropolitan Shanghai and suburban towns like Dayuan. In the town’s older neighborhoods, you see a mix of elderly and children with a conspicuous absence of the robust working age group of 18 to 25. The young and mobile have migrated to the metropolitan cities in search of more interesting work and that bit of excitement. 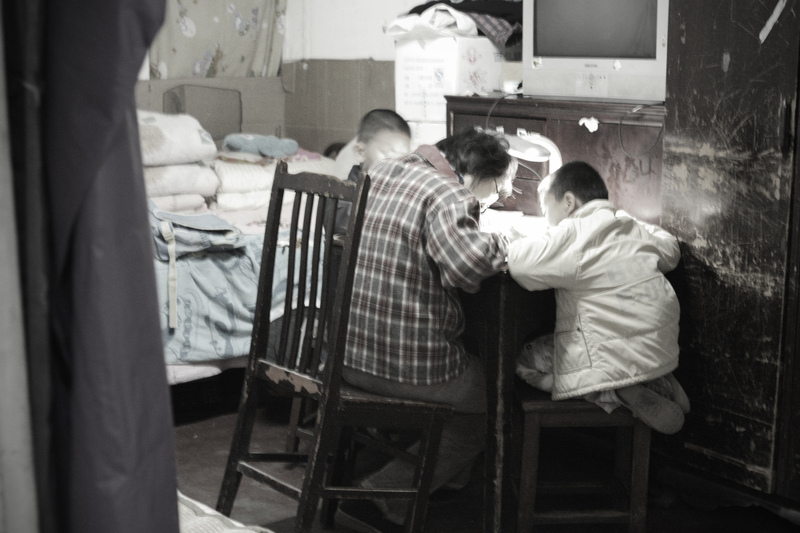 The elderly living in Dayuan tend to have lived in Shanghai for a long time, some migrating from the city center to the outskirts. They while their time away playing cards or chess, drinking tea, cleaning and strolling on the grounds. They live modestly, sometimes growing their own food, diligently recycling what they can into an accoutrement of knick-knacks like dried leaves as broom bristles or using plastic bottles to store loose grain. A 15 minute walk off the highway where we were dropped off, we found ourselves in a leafy lane hugged by old houses, new shop fronts and the occasional factory space. In one of the small lanes, we found an old man making old-style cloth shoes in his living room. He measured pieces of paper on cloth, used glue of his own concoction – entirely organic – and glued the layers together and eventually sewed them by hand and machine. 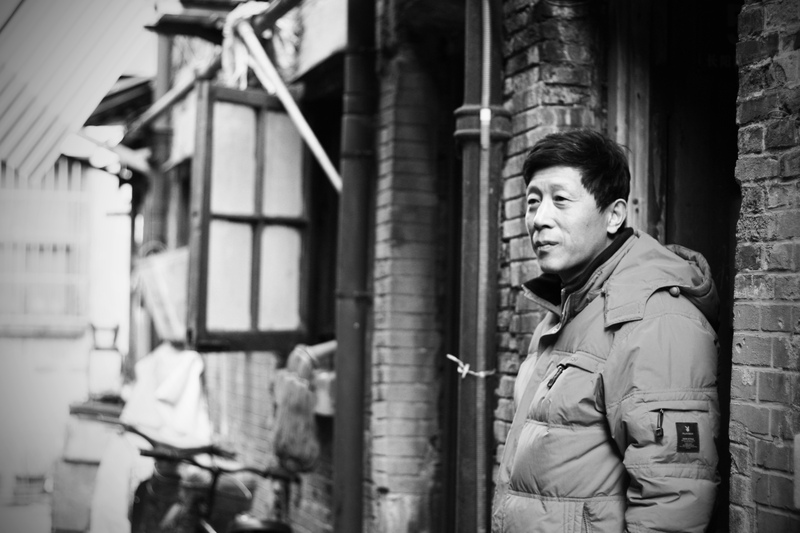 88 years old, he lived in Shanghai his whole life. 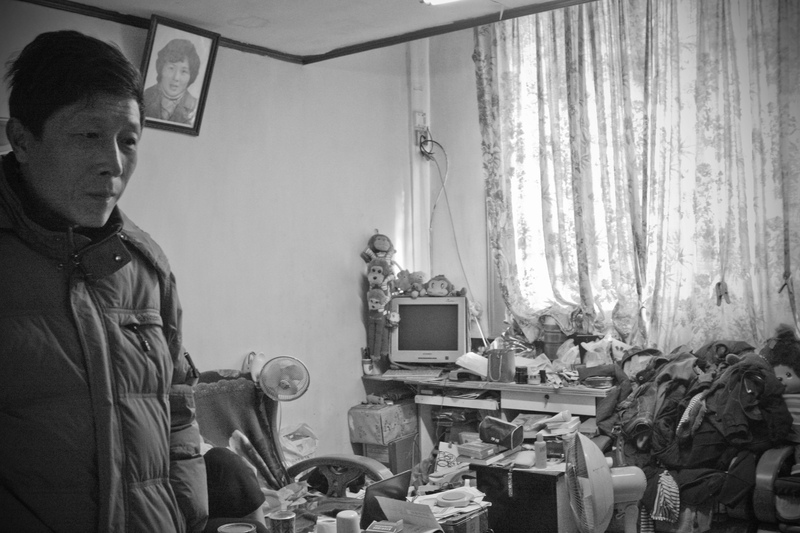 His living room was stacked high with rubber soles, scraps of cloth and paper. And while his movements were slow and deliberate, he was still alert and humorous, indulging us in great detail of his craft. In another old-style Jiangnan (江南) house with curbed rooftips, which once served as a sock production unit decades ago, I found a husband and wife couple quietly snipping away stray threads off bags of socks. When asked if they were still in the business of producing socks, they laughed. No no, the wife said, we just get paid a bit of money to clean up loose ends and pack them before they get shipped out. Their relatives continue the socks production business but at a real factory. As are most small towns, everyone is friendlier and warmer. Come sit down and have a cup of tea, indulge in a tale or two about the history of their lives or the town. An old man sang and played his erhu (二胡) for us while another showed us his shockingly large collection of junk electronics harking back to the 60s. There was no better way to spend the day, under leafy trees in the summer sun. And if you collect stories like me, be it large cities or small towns, the stories are always entertaining yet meaningful. He had a smirk on his face that came as quick as it disappeared. A winning hand perhaps? It was hard to tell with the room thick with cigarette smoke and the clattering sounds of mahjong tiles on wood. I had ducked into the hallway of a 3-storey house. Standing next to a large wooden red door, I heard low murmurings that gave way to loud yelps of triumph. It was a victory so spectacular that people were yelling back and forth with loud thumps of the table signaling another go at Lady Luck. I knocked hesitantly, wondering if I was walking into some gang-related activity. A middle-aged man opened the door with a cigarette in his mouth and frowned at me. Behind him, the frenzy behind muffled doors revealed China’s all-time favorite indoor activity: mahjong. A game of mahjong, poker or anything that involves the thrill of hedging money will draw neighbors and friends round a table like that of a free buffet. A winning hand would inevitable draw chuckles, hoots and backslaps. But it seemed that the mahjong table had entered the 21st century. The whole contraption was mechanized such that with a touch of a button, the middle section would open up and you could dump your tiles in to be automatically shuffled. Another button would elevate your arranged tiles into 4 lines in front of each player. The entire contraption started at a modest RMB 1,500, ready to light up and boogie at your pleasure. The entire country is in a perpetual state of self-improvement so as to reach the next level of the socio-economic ladder. Since time immemorial, each generation worked to widen the proverbial door for the descendants, they had believed was closed to them. When they tell you Chinese people are hardworking, they didn’t make up that stereotype. It’s true. As a child in China, one is never free from the clutches of school homework, even on a weekend. If it’s not multiplication tables, it’s copious Chinese text to copy and memorize. That’s all one ever does. Memorize. Meanwhile, pencil to paper is all you can do to make the time fly by before playtime, even if all the answers were wrong. That’s when you hear the parent chasing the child around the room, sometimes wielding a threatening slipper. “Sit down! Stop running! Do your work!” A hard thwack on the bum to set you straight and a firm thump of the table to drive the point home. Sometimes, you can hear the yelps, laughter and wails of pain from the next alley over. I had never met a resident in the longtang (弄堂) who owned all three floors of his shikumen (石库门). The structure is traditionally narrow – the door opened into a tiny flight of stairs that led to a large living room and a small bedroom, followed by a small kitchen and an equally small shower/toilet on the third floor that was recently installed. Many residents in longtangs do not have their own toilets. Yet for all the space the gentleman had, one could not help but notice all the clutter. It was everywhere. Boxes, books, soft toys, clothes, appliances and more bits and bobs were crammed into every crevice that mapped the living room into a topography of an even larger mess. Abashed, he apologized for the state of the room. He worked at the shipyard and lived with his college graduate daughter who stared blankly at me as I spoke with her father at length. His wife had passed on a while ago due to diabetes. I did not probe. The man cooked and cleaned when he can and at the moment, was taking care of his unemployed daughter who had a slight cold from the winter chill.